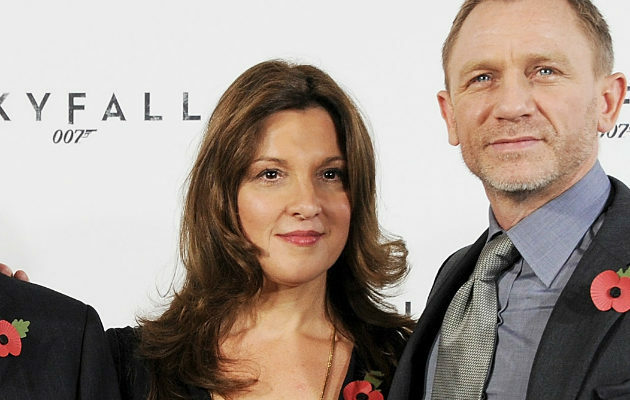 Barbara Broccoli was born into the world of James Bond; along with co-producer Harry Saltzman, her father, Cubby Broccoli, brought 007 to the big screen with Dr. No when Barbara was only two years old. It would be inaccurate to say Broccoli inherited the Bond legacy — she’s made it her own, serving as producer from Goldeneye onwards, and in many ways, ushering cinema's favorite secret agent into the modern era. The Skyfall producer rang Movieline to talk about the early days, Bond's role in the cultural conversation over the years, and what the future holds for the character who, fifty years later, is still synonymous with effortless cool. Tell us a little about the beginning of the Bond film franchise. How did your father, Cubby Broccoli, along with Harry Saltzman, make the decision to adapt Ian Fleming's spy novels? My father had wanted the rights to the films early on, but they eluded him. Harry Saltzman had an option, and my father heard this, called him up, and they joined forces just as the clock was ticking down, as the option was about to expire. Fortunately, they went to Arthur Kremp, who my father had a relationship with, and asked him if he would finance the film (Dr. No). David Picker, who was the young executive in the room, loved the Bond books, and he persuaded United Artists to take a shot and make the film, which was a huge commitment then. A million dollars for a budget, at that time, was significant. They were a force to be reckoned with. Cubby and Harry were both very passionate, determined men. They were driven. They wanted to see this series of books made into a film, and they were very passionate about their choice of Sean Connery, who was an unknown. They fought for him, and there was a lot of resistance because he wasn’t well known at all. The studio wanted a star, they wanted an American and all these various things, but [Broccoli and Saltzman] stuck to their guns, and the rest as they say, is history. Bond is turning 50 this year. In 2012, he’s still going strong. Why has the franchise endured? It basically comes down to Ian Fleming. I think he wrote a very complex character that has been able to evolve through the decades, with the assistance of the extraordinary men who have played the role, starting with Sean Connery who established the role to great effect in Dr. No, and all the subsequent actors have taken it and made it their own and made it of their time. I think Bond the character is distinct: He’s British, he has a certain code that he lives by, he’s incorruptible… he’s a classical hero, but he’s also fallible. He has inner demons, inner conflicts, and he’s a romantic. He gets himself caught up in all kinds of situations because of his heart, which gets broken in Casino Royale. He knows at the end of that first story that in order to do the job he does he has to make a lot of personal sacrifices, and one of them is that he cannot really have a proper relationship or a family, and that is a burden to him. By that same token, how do you think the character of Bond has evolved over the years, beginning with Sean Connery and running up to today with Daniel Craig’s portrayal? With Daniel, the first film he did was Casino Royale, which was the first book, so that’s very much about how Bond became the Bond that we all know and love. It explains a lot about his history and why he got to be the way he is, particularly in his relationships with women, as I described. He knows he’s unable to really form a proper commitment with a woman because he may be captured, tortured, as he is in Casino Royale… he can put himself in that situation but he couldn’t put anyone else he loved, like a wife or a child, in that kind of jeopardy. So, I think with Daniel, it’s sort of come full-circle. We started with Fleming and fifty years later, we’re back to Fleming again: He’s very much central to the making of these films. The spirit of Ian Fleming is always with us and we particularly honor and celebrate him now, fifty years later, during this anniversary. Can you talk a little about your own relationship with 007 from a personal standpoint and how it’s changed from your childhood to the present? I was born in 1960, my father did the deal in ’61, and the first film was made in that year and released in ’62, so my life is synonymous with Bond. Growing up he was a huge figure in our lives, so much so that I thought he was a real person [laughs]. But it soon dawned on me that he was a fictional character. I spent a lot of time on the sets growing up. We would go on vacation from school, go on location, where the films were being filmed. Wonderful places: Exotic locales like Japan and the Bahamas, and the people making the films were part of our extended family. My father would be with them all day long and they would all come home for dinner. We were always together. It was a very large, happy family. Do you think Bond’s place in the pop culture spotlight has been constant, or has it fluctuated over the years? What kinds of challenges arise in making this franchise relevant to audiences today? There have always been challenges. I remember when we were doing Goldeneye and people were saying “The Cold War’s over, the wall’s down — does the world need James Bond anymore?” Of course, the answer was a resounding “Yes!” Just because the wall came down didn’t mean the world was at peace. In fact, good and evil were slightly blurred, and we didn’t know who the enemy was. I think we’re always trying to come up with intriguing storylines and villains for Bond to go up against, and when you look at Skyfall, and you look at Javier Bardem you’ll find… [laughter] he’s sort of the ultimate Bond villain. He’s provided a very exciting counterpoint to Daniel. How did Sam Mendes get involved with Skyfall? Well, Sam and Daniel had worked together on Road to Perdition, and they’d had a great collaboration. When we were looking for a director, Daniel called us up and said “Oh, I was just at a party last night with Sam and I asked him if he wanted to do a Bond film — it turns out he’s a huge fan. What do you think?” And we said, “Oh my goodness, do you think we could actually get Sam Mendes? He’s a consummate film director, Oscar-award winner. Do you really think he’d be interested?” So we met with him, and it turns out — who would have known it - he’s a big Bond fan. So we snapped him up. He’s made an unbelievably terrific film, so we’re delighted. Has it been a little different working with a director like Sam, who is such a force of nature, on a franchise project like Bond that in the past has largely been producer-driven? I guess our attitude towards Sam was “We have a set of parameters as far as what we feel a Bond film is, but within those parameters…” There’s no point in hiring someone like Sam Mendes and then tying their hands. We wanted him because of his talent and his vision, and we worked together very closely on the script, and set the parameters together. He wanted to make a great Bond film, so it all turned out extremely well. As it turns out he was just like a kid in a candy store [laughs]. He loved the challenge, he lived up to it, and he exceeded all expectations. So I think the film has got all the wonderful, dramatic intriguing storylines and characters — we have a wonderful cast, many of whom were attracted to this because of Sam — and he’s also delivered tremendous action and excitement. He’s ticked all the boxes as far as I’m concerned. Learn more about Barbara Broccoli and the Bond legacy in the EPIX documentary Everything or Nothing: The Untold Story of 007. Read more in Movieline's ongoing Bond at 50 series leading up to the November 9 release of Skyfall. John Jarzemsky is a contributor at LitReactor, Twitch, and can be read semi-regularly at his personal blog, the ineptly named Super Roller Disco Monkey Hullabaloo! or on twitter @jtjarzemsky. He is big in Japan. I am from india and a huge James Bond fan. But i hate the recent bond movies as in these movies bond acts as Jason Bourne . James bond is all about style and producers should have followed that trend .Now a days bond rarely says :" Bond,James bond". I miss the charm and wit of Moore, but I do think Craig is doing a good job. I guess that all previous Bond films up to Craig has had charm as an ingredience, except License to Kill. Craig is trying, but the stories has been a bit heavy and serious. It is more about the dept of the charachter, and the question is - do we want to know much about Bonds motives or do we want a couple of hours of distraction and entertainment.